Senator-elect Keith Thomson, a trenchantly conservative Republican congressman and war hero, died of a heart attack Friday at the age of 41. Thomson’s totally unexpected death was termed “terrible, unbelievable for Wyoming and the nation” by Republican Frank Barrett, a former governor and former United States Senator. 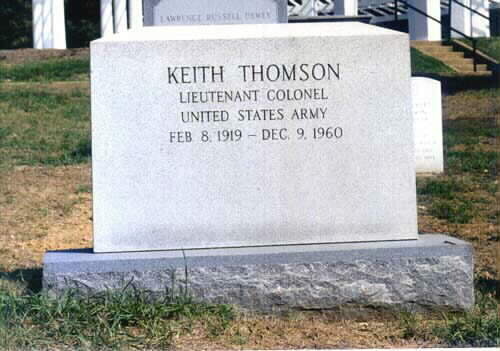 In 1943, Thomson became at the age of 24, the youngest battalion commander in the United States Army. He won four decorations during World War II. Thomson had complained for several days of illness and recurrent stomach pains. On the advice of a doctor, he cancelled an appearance at a luncheon scheduled for Saturday in Cody. He was visiting the Cody home of Kenneth Bailey, an old friend, when he was stricken. Bailey summoned two physicians, who were present when Thomson died. The doctors agreed that he had succumbed to a heart attack. Thomson’s wife and three children were in Washington when he died. Thomson was known as an uncompromising conservative in Congress, to which he was elected three times. He was the first incumbent Congressman to be elected to the Senate from Wyoming. Both doctors attempted to revive Thomson by artificial respiration then cut into his chest and massaged the heart but could not save him. Schrader’s Funeral Home of Cheyenne was scheduled to hold funeral services early next week. A Wyoming Air National Guard plane was scheduled to return Thomson’s body to Cheyenne Saturday. Dr. John M. Pattison, pastor of the Cheyenne First Presbyterian Church will officiate. Thomson, an intense man, with a shock of black hair and a lined, earnest face devoted his political life to the conservative position. “I believe the most important thing in America today is to preserve opportunity for the individual,” he once said. He was born February 8, 1919, at Newcastle, Wyoming, and educated in the public schools of Beula, Wyoming. Both his parents, William Thomson, and the former Forbes Coffey, were of pioneer families. Thomson left home at 16 to attend the University of Wyoming and worked his way through washing dishes, digging ditches and clerking in a bookstore. He married Thyra Godfrey of Cheyenne while he was in the university’s law school. Mrs. Thomson was in Washington with the couple’s three children when Thomson died. She was notified immediately. Thomson was graduated with a law degree in 1941 and in March of that year was called to active duty as a second lieutenant in the infantry. He served five years as an infantryman in the United States, Italy and Africa. In 1943, when he assumed command of the 2nd Battalion of the91st Infantry’s 362nd Regiment, he was the youngest battalion commander in the United States Army. Thomson was discharged as a Lieutenant Colonel and was awarded the Bronze Star, the Purple Heart Medal, the Legion of Merit and the Italian Cross of Valor. After his discharge in 1946, Thomson entered law practice in Cheyenne with Cheyenne attorney Harry B. Henderson. He was a member of the Wyoming House of Representatives from 1950 to 1954 before he ran for his first term in the U. S. House of Representatives. 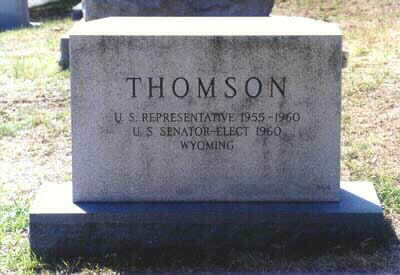 Thomson was returned twice to the House of Representatives before Wyoming voters elected him to the Senate by a 17,000 vote margin over his Democratic opponent, Raymond B. Whitaker. Whitaker also ran against Thomson in 1958 when Thomson won his third term in the House. Thomson led all partisan candidates in the 1960 general election. Political friends and foes alike were shocked by the sudden death of Senator-elect Keith Thomson on Friday. Wyoming Governor Joe Hickey, a Democrat, led a bipartisan eulogy of the 41-year-old Republican who died of a heart attack on Friday afternoon. “Senator-elect Keith Thomason was a devoted and conscientious servant for the state,” Hickey said in a telegram to Thomson’s widow, Thyra, who was in Washington when Thomson died. “It’s a terrible, unbelievable thing for Wyoming and for Keith’s wife and children,” Barrett said. “I perhaps knew Thomson in a way that no one else did and as well as being opponents, we were friends,” Whitaker said. Tracy S. McCraken, Democratic national committeeman was advised of Thomson’s death in Las Vegas, Nevada. McCraken said, “I am deeply distressed to hear of Keith’s untimely passing and I extend to Thrya and his family my deepest sympathy. “He was an extremely intelligent young man and in my estimation had a bright future ahead of him. He has certainly shown his popularity with the people of Wyoming in his four different Congressional races. “Here in the town of Newcastle, where Senator-elect Keith Thomson was born, the place he always called home, people are almost speechless with shock and grief,” Thorson said. “My first thought goes to his wonderful wife and family,” he said. “The loss of such a devoted husband and father must be almost more than they can bear. Knowing Keith as intimately as I have, of course, my sorrow is profound. Thomson was a member of the American Legion, Veterans of Foreign Wars, the University of Wyoming Alumni Association, the stare and Laramie County Bar Associations, Phi Delta Theta fraternity, the Lions Club and the Presbyterian Church. In addition to his wife and three children, William John II, Bruce Godfrey and Keith Coffey Thomson, he is survived by his parents, at Newcastle, a bother Tom Thomson, a student at the University of Wyoming; two sisters, Mrs. Robert Conway of Newcastle and Mrs. Vern Heffner of Newell, South Dakota, and an uncle, Tom Thomson of Newcastle. Mrs. Thomson and her sons are expected to arrive at Cheyenne tomorrow after a flight from Washington. Governor Hickey did not indicate who he might select to serve the first two years of Thomson’s term, except to say it would be himself. Two possibilities were Whitaker and Teno Roncalio, Democratic state chairman. Thomson would have replaced the venerable Democrat Joseph O’Mahoney in the Senate. O’Mahoney did not run for re-election due to ill health. Under the Wyoming constitution, the voters will not choose a Senator to serve the balance of Thomson’s term until the 1962 general election, Attorney General Norman Gray said. The State of Wyoming mourned the death of its senator-elect this week with the sudden death of Representative Keith Thomson, 41. The popular young Republican office-holder died of a heart attack early Friday afternoon at the home of his close personal friend, Kenneth Bailey, Cody CPA. Mrs. Thomson and three sons, Bill, Bruce and Casey, were in Washington, D.C. when the untimely death occurred. Funeral services, with many of the nation’s top political figures attending, were held at Cheyenne’s First Presbyterian church on Tuesday. The body had lay in state in the Capitol building prior to the services. In Cody and in Wyoming, Keith Thomson’s death was viewed with dismay, not only by those who were his close friends, but by the public in general. The 41-year-old Senator-elect had just set an all-time voting record for Wyoming by receiving a larger majority even than the presidential candidates in November’s general election. Thomson’s political record was felt across the border in Montana, causing the Billings Gazette to editorialize on the loss to the Western states and the nation. Thomson was admired and highly respected by both political parties. It was rate that the opposition party found opportunity, or saw fit to attack him personally. A public servant who drove himself relentlessly, Keith Thomson held a nearly 100 percent voting record as a member of the House of Representatives in two terms. His percentage was the same in defending state’s rights, and economy in the Federal government. Keith Thomson was born in Weston County, a member of a pioneer Wyoming family. He entered grade school at Beulah, Wyoming. A 1941 graduate of the University of Wyoming School of law, he began a period of distinguished service in World War II. He was decorated for valor in the Italian Campaign and was the youngest battalion commander in the United States Army. Following his war service, he entered the practice of law in Cheyenne, rapidly acquiring a reputation as a public servant by his participation in numerous civic organizations. He spent two terms in the Wyoming Legislature before being elected to the United States House of Representatives. Thomson’s death was unfortunately clouded by a political battle for his successor. Republican party leaders including Milward Simpson of Cody are urging that his wife, Thra, whom he married while a student at the University of Wyoming, be appointed to service a two-year term until the next election. The appointment was conceded to be the privilege of Governor J. J. (Joe) Hickey, Democrat. Republican leaders immediately set up a legal research department using five state law firms to determine if the Governor could make the appointment. The Democratic Party, too, began its search while pondering what action Governor Hickey might take, some surmised that retiring Senator Joseph O’Mahoney should remain in office, never having been completely succeeded. Republican leaders began a statewide campaign urging supporters to deluge the Governor with requests that Mrs. Thomson, or a Republican receive the appointment. Republican state chairman John S. Wold said, “This is a situation without precedent in Wyoming and we feel that we should carefully examine all the legal aspects of the matter of replacement, whether by appointment or election, especially in view of the clear mandate Thomson received from the electorate of Wyoming for the Republican principles for which he stood so strongly. Because he literally died working for the principles in which apparently the vast majority of Wyomingites believe, we feel that we can best serve the memory of this fine man by continuing to work ardently for his replacement as soon as possible by a Republican who will carry on the great tradition in which Keith Thomson put his heart. Representative from Wyoming; born in New Castle, Weston County, Wyoming, February 8, 1919; attended the public schools in Beulah, Wyoming, and Spearfish, South Dakota; was graduated from the University of Wyoming Law School in 1941; called to active duty on March 24, 1941; commanded Second Battalion, Three Hundred and Sixty-second Infantry Regiment, Ninety-first Division; released from active duty as a Lieutenant Colonel on January 24, 1946; was admitted to the bar in 1941 and commenced the practice of law in Cheyenne, Wyoming, in February 1946; delegate to the Republican National Convention in 1952; member of the State house of representatives 1952-1954; elected as a Republican to the Eighty-fourth, Eighty-fifth, and Eighty-sixth Congresses and served from January 3, 1955, until his death; did not seek renomination to the Eighty-seventh Congress but was elected to the United States Senate on November 8, 1960, for the term commencing January 3, 1961; died in Cody, Wyoming, December 9, 1960; interment in Arlington National Cemetery.